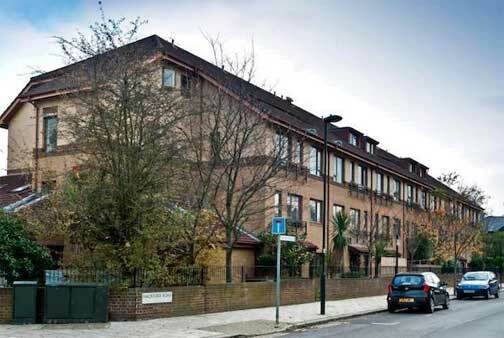 Leasehold reached a new low with Pier Management demanding a subletting fee from a man who is dead. 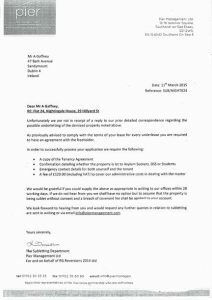 Nor was a sublet fee payable had Mr A Gaffney, of Dublin, been alive. 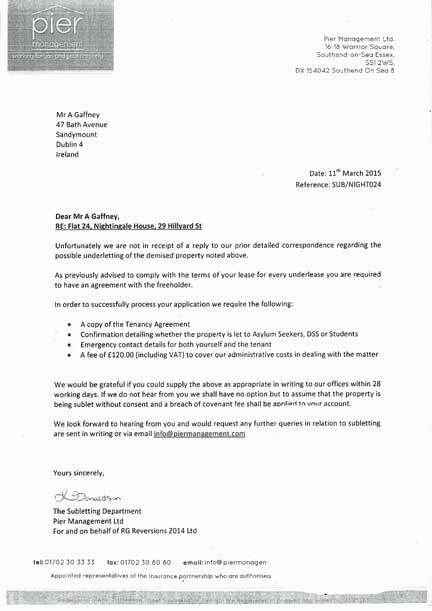 Pier Management admitted it had not read the lease before demanding the money, it is claimed – a not infrequent omission in sublet demands. The demand was sent out by Pier Management on March 11, which appeared to be a reminder. The demand outraged estate and letting agent Richard a Brassard, of Courtneys. The group is owned by Peter Edward Gould and Nicholas Charles Gould, two Essex-based brothers, who have built it up over the past 30 years and are reportedly worth £355 million. Mr Brassard noted following a phone conversation that Pier Management had made its demand before even reading the lease, which he described as “unacceptable and unprofessional”. He also brought the matter to the attention of his Battersea MP Jane Ellison and Sir Peter Bottomley. “… your letter has done nothing, but cause worry to someone who is understandably extremely concerned about your threats”. “I concur, having reviewed this Lease I note that there are no restrictions to prevent you from subletting the property so I apologise for this oversight. Perhaps Pier Management thought a ghost was living in the flat and they wanted to re-posses it ! Regarding the recent article posting, Pier Management issued an apology to Mr Brassard and the client, who have confirmed that the issue has now been resolved to his and his client’s satisfaction and requires no further input from Pier Management. Pier Management strive on delivering the very best in property management services for Leasehold and Freehold owners throughout the UK. As a result of the incident all staff members have been reminded of the importance of inspecting all aspects of the lease before issuing communications of this nature going forward. Customer service is at the forefront of our business and we will continue to review and improve processes. It is pleasing to know that some Managing Agents follow the many comments that are placed on Campaign against retirement leasehold exploitation and LKP I will also place this apology on About Peverel, so more of us will be aware that at least this company did wrong and said sorry. Peverel Retirement also read all the comments, I have been informed, they are sent around the office in paper form, in case they are caught reading the news to each other. The news that Sir Peter Bottomley standing down is good for him and he will always be regarded as a real champion and will be our loss, thank you Sir Peter if you are ever in Church Stretton you will be made welcome. Campaign against retirement leasehold exploitation replies: Although we are sure Sir Peter Bottomley will appreciate the sentiment expressed and the kind invitation, he is not standing down and is presently campaigning to hold his seat at Worthing West. Indeed, he maintains regular contact with us over leasehold issues and plans – barring an electoral mishap – to host a Westminster meeting on leasehold in July. I thank Pier Management for their response. I would hope that they will also take away the “presumption of sub-letting” unless they receive a response from a leaseholder. when they review their procedures. It would be a good idea when demanding sub-let fees to be specific as to the schedule of the lease that permits sub-let fees. Pier doesn’t mention your lease – but their message is clear, willy nilly: if you sublet you must pay a fee. Pier also refers to an admin fee and isn’t clear whether this is in addition to – or in place of – a licence fee. Under LTA 1985 s18(2) the landlord is entitled to to be reimbursed for their costs ‘in connection with the matters for which the service charge is payable’. The fees that Pier charge leaseholders to sublet are unrelated to service charge. Here we have an easy ‘mistake’ commonly made by landlords and managing agents to ignore the lease (except where it suits them to collect service charge) and misinterpret legislation for financial advantage. Such ‘mistakes’ are unwittingly promoted by those in public office who, if they have looked at the lease, clearly do not understand it. The Lands Tribunal ruling of January 2012 (reported by LKP in November 2013) of an upper limit of £40 + VAT for fees to sublet which are not specified in the lease is (a) contractually highly dubious and probably rubbish (b) making you wonder whether those who sit part-time on the tribunals aren’t full-time property entrepreneurs. If a lease neither expressly nor implicitly gives the landlord a right to charge for subletting, then Pier and others should be challenged. In our lease, there is an implied right to charge an admin fee to sublet at the point when leaseholders are required to notify the landlord – that is, only in the last three years of the 99-year term. We challenged Pier back in 2011 when they were charging £120 to sublet here at Mill Quay E14. We succeeded but only in the final round having reported them to their local Trading Standards officer. At that time, the wording on their website relating to subletting was identical to today’s entry entitled ‘Renting your property’. Pier Management is the agent for our landlord Ground Rents Regis. They share common directors and the names that appear frequently in over 100 companies involved in the murky and incestuous property sector include Paul Macfadyen, Regis md, Nicholas Gould, Peter Gould (both noted by Admin elsewhere) and Piers Devigne. Pier’s apology, on the LKP website above, with an undertaking to remind all staff ‘of the importance of inspecting all aspects of the lease …’ is meaningless unless they agree to amend the wording on their own website so that leaseholders understand that their lease is the deciding factor on whether or not fees are payable. Back in 2011 we asked them to amend the wording to include reference to the lease. They refused.